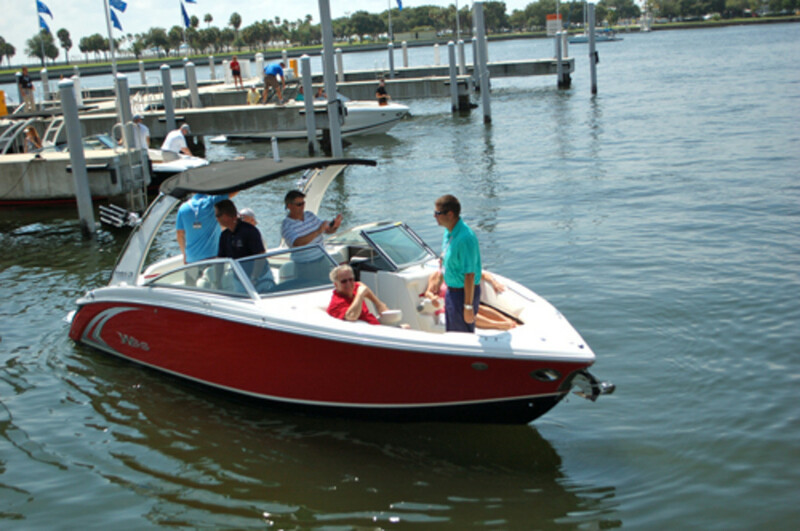 Cobalt Boats held a “Ride and Drive” event in St. Petersburg, Fla., to allow customers to watch demonstrations and take the helm of 14 new models. More than 200 invited guests were some of the first to take a sneak peek at the new 2014 boat line, which includes the Water Sport Series, Cruisers, SD Series, A Series and the R3 and R7 Bowriders. The display was showcased by Cobalt representatives, along with a team of technicians from Mercury and Volvo. In conjunction with the Sept. 8 event, Cobalt had its annual dealer meeting conference at the Vinoy Resort and Golf Club in St. Petersburg. The conference brought together dealers from across the globe to experience what’s in store for the 2014 model year. The agenda featured an introduction of the new 2014 models aboard “Yacht Starship,” Florida’s largest dining yacht. Discussion centered on the new R Series introductions, which included the R3, R5 WSS and R7. In addition, the 2014 model year will showcase the new 220S.